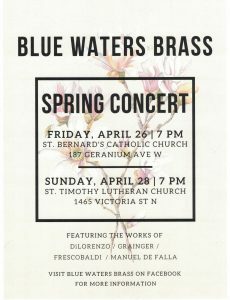 Blue Waters Brass was formed in the fall of 2011 by several St . Olaf College friends who were looking for a musical outlet after graduation. The ensemble performs regularly in the Twin Cities area and is known for its wide variety of repertoire spanning the genres of classical, bluegrass, march, jazz, renaissance, contemporary, and locally composed works. BWB is an active participant in the communities of its members and has undertaken several collaborative projects with other local groups. Please make checks payable to Blue Waters Brass. Or support us by making a donation online! Blue Waters Brass is operated exclusively for charitable and educational purposes within the meaning of Section 501(c)(3) of the Internal Revenue Code. Reference EIN 81-2544732. Support us as we continue to grow and bring quality music to our community!